The Strategic Compass defines the effect each single individual can have on the results of a company. Managers and Directors should make getting this right their #1 HR priority. When I started my MBA Thesis, I was Project Manager when HP was a Technology Company in motion. There was the merger going on with Compaq. I was interested to see if we really did understand the strategy our CEO Carly Fiorina was implementing and see if we really understood what she was trying to achieve. HP is using Management by Objectives since it was founded and we decided to use translation of the grand objectives to the day-to-day objectives as a measure. The idea behind the Thesis Subject was that the workforce of any company have their own idea what the strategy of the company is and will act accordingly. Mintzberg studied this effect and theorised this as Intended v.s. realised strategy. In order to get a grip on the strategic results, HP has always used clear objectives and a elaborate method to enable the management and workforce to execute the strategy as intended. The whole Management by Objectives process is very well designed and religiously executed by the Management. As with any other company, the strategy is not fully realised. This leads to the question, how can we improve this process? For this I selected two points of attention: A method to continuosly apply control to Strategy Execution as it is being executed. The continuous control method is needed to limit the process’s hysteresis. And a common Understanding of what the objectives are and what they mean to an individual. As with any controlling process, there needs to be a measuring method with pre-defined actions in case process parameters surpass prameter thresholds. I selected the method defined by Gratton for this study. 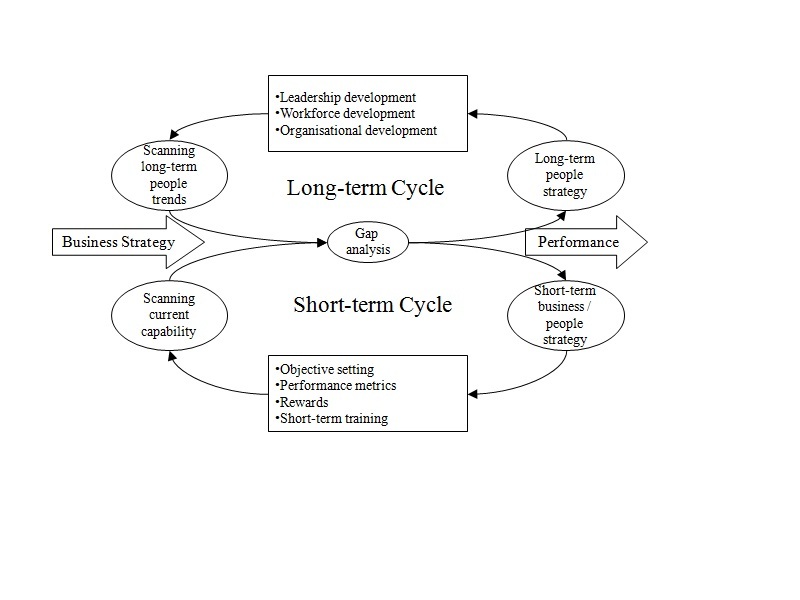 The process suggested by Gratton meassures the Output of the Business Startegy against the input by applying a gap analysis and dividing the measures into short-term and long-term. This approach makes it easier to distinguish what the individual and her / his direct Management layer can to to improve day-to-day operations, and what higher Management can do to improve policy, aplying budgets where it most appropriate and apply tactics to direct the company as a whole. The gap analysis is the central process that can empower both Management and Workforce. The HOSHIN plans the employees make can now be used as a basis for this regular gap analysis. The output of these gap analyses can be weighed against the prioritised objectives to define further action. With all the effort we put into HOSHIN plans etc. 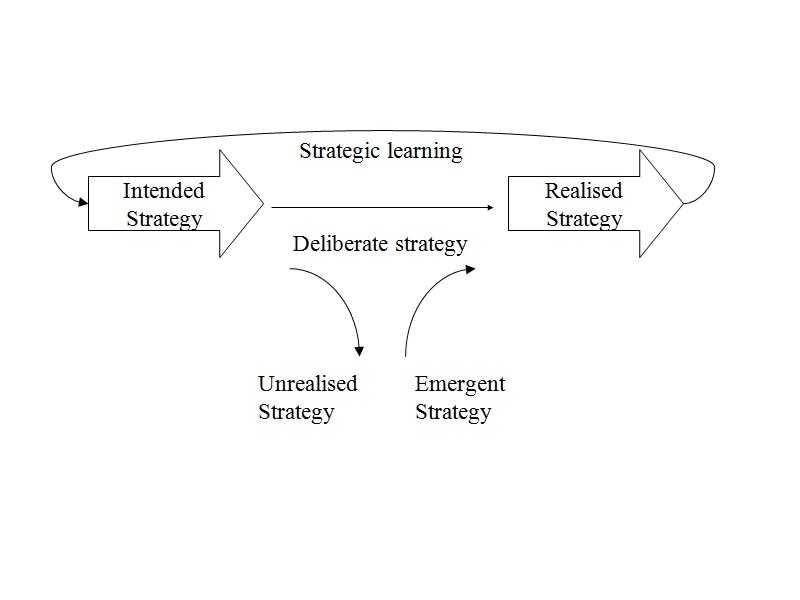 it is still evident that the Intended Strategy is not always ralised, or not realised sufficiently, which is a waste. In this page I use the words “Management” and Workforce” to make a distinction between the roles individuals have within the population of a company. Management is also part of the Workforce. The meaning of anything: If I say “Tree” within a group of people and each individual explains what a typical “Tree” is to them, I am sure to get a different description from each individual. You do not want this in case Strategic objectives are discussed or embedded into people’s daily activities; Management and Workforce alike. For this reason, we set out to define what the Objectives mean. The sponsor of the study defined the Objectives, the relationship between the Objectives and the priority of the Objectives. The relationship between the Objectives is needed to understand how the Objectives depend on each other. Growth is strengthened by strong customer engagement. The uniqueness of this study was that the study could also be used to determine how the ex Compaq employees and Original HP employees perceived the Objectives. 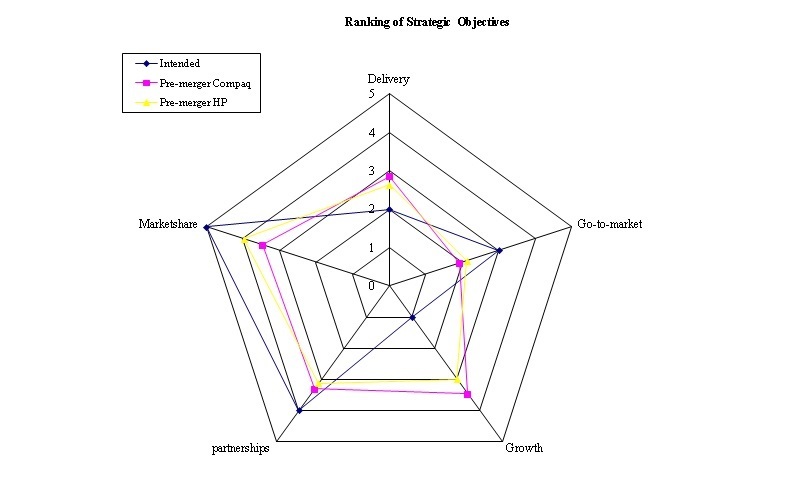 In this graph, the priority of the Objectives is compared to the perceived priority by the Workforce. The two bloodgroups of the Workforce are reasonably in line on the priorities of all Objectives. They do differ strongly with the Sponsor’s intended strategy for Growth and generally on all Strategic Objectives. This graph clearly shows how important clarifying the priorities is. 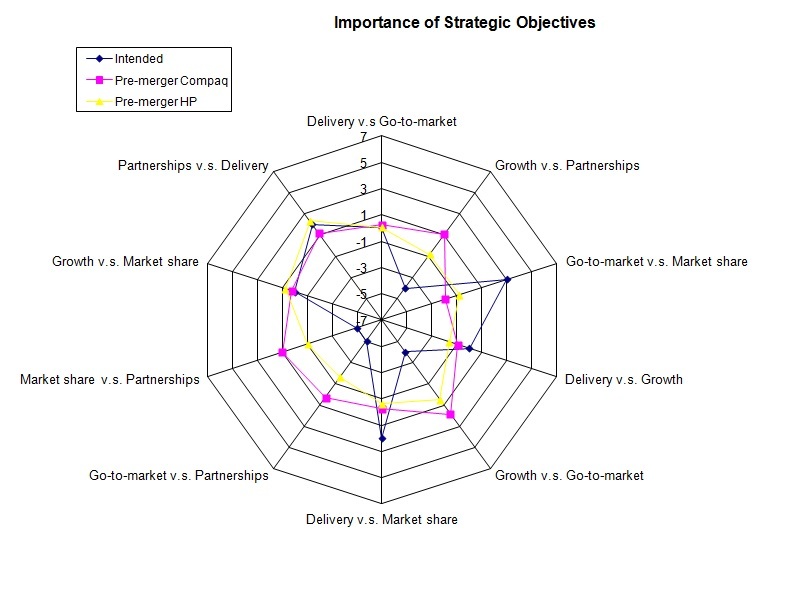 In this graph, the Objectives are compared pair-wise by the Sponsor and Workforce, then sorted as a combination of each other. The differences here become more pronounced and extreme, since this method forces the respondent to actually compare the Objectives, which needs much more thought than just listing the Objectives in any order. 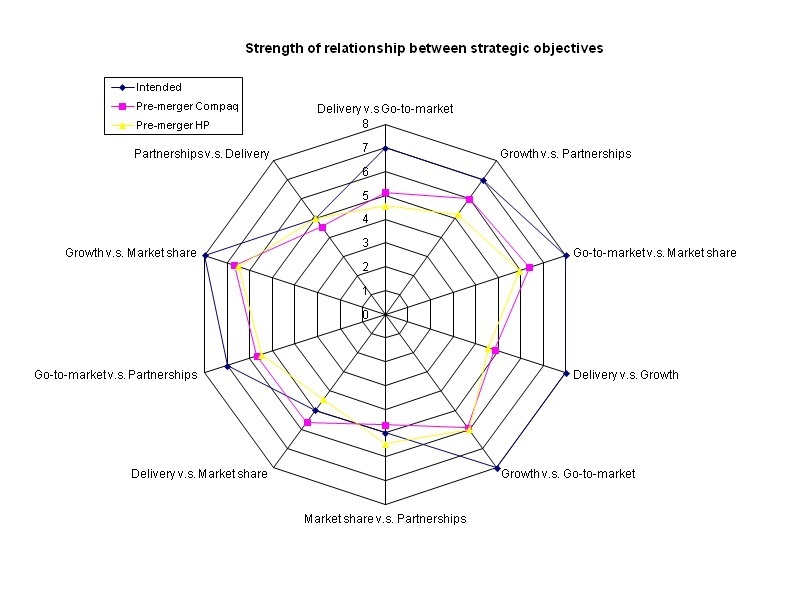 The last results graph shows how the Sponsor and Workforce percieve how synergetic the Objectives are. Again there is a large difference between the intended Strategy and how the different blood groups of the Workforce perceive the synergy of the Objectives. Though the differences between the intended strategy, the percieved strategy and the way the different blood groups percieve strategy may seem trivial, reducing these differences is vital for a strategy to succeed. Zero difference means all “Noses are pointed in the same direction”. It means all employees do the right things for the right resaons. So, if you multiply each difference by the amount and effect each employee can have on a companies Business, then you understand that even the tiniest misunderstanding in what Strategy means on a personal level can be very detrimental to the companies success. It is the scale that make the Strategic Compass for the company and the employee a very important focus for a large company. 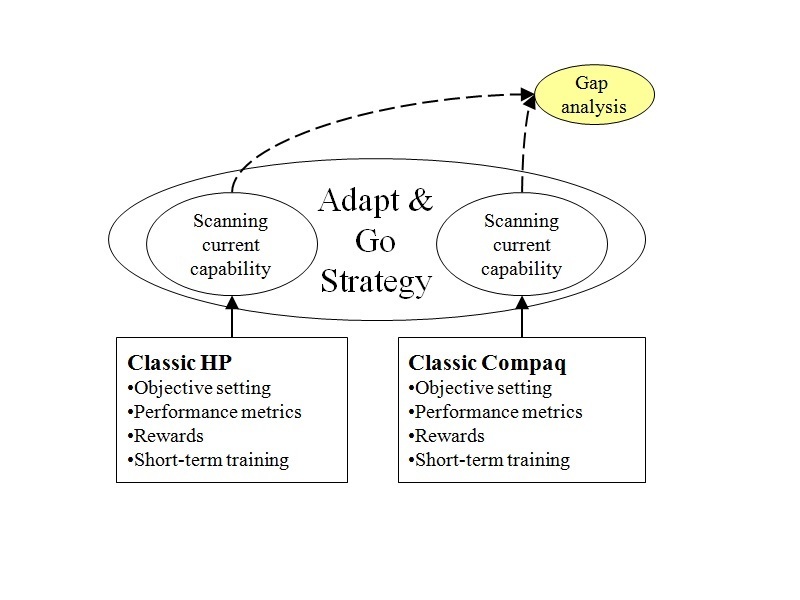 HP implemented the Adapt & Go strategy that used the best Strategic Tooling of both companies combined with intensive communication from the top Management of HP to deilver one of the most succesfull mergers in history. Some may not agree, yes, things could have been done better. Sure, in retrospect we all know how. HP and Compaq went ahead and did it! I for one, am proud to have been participant of this historic event and thankfull for the opportunity to have had a go at such an interesting Thesis study subject.